All of the below was examined in November 2010. We also looked for new information in January 2011. We have not found a comprehensive breakdown of activities or spending on them, at a more detailed level. Chronicle of Philanthropy. &dollar;1.1-billion donated for Haiti relief: Updated tally. http://philanthropy.com/article/11-Billion-Donated-for-Haiti/65479/?sid=... (accessed September 20, 2010). Archived by WebCite® at http://www.webcitation.org/5ssx7IcOw. Chronicle of Philanthropy. American charities raise &dollar;709-million for haiti relief, Chronicle tally finds. http://philanthropy.com/article/American-Charities-Raise/64193/?otd=Y2xp... (accessed September 17, 2010). Archived by WebCite® at http://www.webcitation.org/5solB4OOD. Chronicle of Philanthropy. Haiti donations exceed &dollar;644-million as of February 3. http://philanthropy.com/article/Haiti-Donations-Exceed-644/63887/ (accessed October 3, 2010). Archived by WebCite® at http://www.webcitation.org/5tD60TduA. Chronicle of Philanthropy. Haiti recovery: How much charities have raised and spent. http://philanthropy.com/article/Haiti-Recovery-How-Much-Ch/64312/ (accessed January 7, 2010). Archived by WebCite® at http://www.webcitation.org/5vZ5NaHMn. World Vision. Annual report 2005 (PDF). World Vision. Annual review 2009 (PDF). World Vision. Annual reviews. http://www.wvi.org/wvi/wviweb.nsf/webmaindocs/16482B29EAF14ADE8825738D00... (accessed January 7, 2010). Archived by WebCite® at http://www.webcitation.org/5vZYAZUYN. World Vision. CHARMS summary Dec 2009 (PDF). World Vision. Global Hope Initiative: Annual report 2009: Executive summary (PDF). World Vision. Haiti financial update: 1 year later. http://www.worldvision.org/content.nsf/about/20101209-haiti-financial-up... (accessed January 6, 2010). Archived by WebCite® at http://www.webcitation.org/5vXU2gdLu. World Vision. Haiti: Blog - John Kisimir http://www.wvi.org/wvi/wviweb.nsf/updates/89A25D8F507B21B1882576D4006318... (accessed November 10, 2010). Archived by WebCite® at http://www.webcitation.org/5u8u6X00m. World Vision.Child health now: Together we can end preventable deaths (PDF). World Vision. Global health and nutrition annual report 2008 (PDF). World Vision. Haiti earthquake response: One year on (PDF). World Vision. Haiti: As hurricane season approaches, World Vision concerned storms could create 'secondary disaster' http://www.wvi.org/wvi/wviweb.nsf/updates/0EC23DC2795633C4882577270067B7... (accessed November 10, 2010). Archived by WebCite® at http://www.webcitation.org/5u8vhW5mA. World Vision. Haiti: Child-friendly space provides some normalcy. http://www.wvi.org/wvi/wviweb.nsf/updates/7ECB5201B5EFBA4A882576C2000725... (accessed November 10, 2010). Archived by WebCite® at http://www.webcitation.org/5u8u93ENd. World Vision. Haiti: Making life bearable. http://www.wvi.org/wvi/wviweb.nsf/updates/EB3C0AAAB4070B81882576B4007171... (accessed November 10, 2010). Archived by WebCite® at http://www.webcitation.org/5u8uBSjit. World Vision. Haiti: Six months later - The life of one child. http://www.wvi.org/wvi/wviweb.nsf/updates/D7D5EE0C12EBCE548825775800610B... (accessed November 10, 2010). Archived by WebCite® at http://www.webcitation.org/5u8u0AZoC. World Vision. Haiti: Vulnerable must be first in line. http://www.wvi.org/wvi/wviweb.nsf/updates/773AFCA4D42EDA6D882576BD006CD2... (accessed November 10, 2010). Archived by WebCite® at http://www.webcitation.org/5u8weDZ9A. World Vision. Haiti: World Vision distributes emergency health supplies, focuses on preventative measures. http://www.wvi.org/wvi/wviweb.nsf/updates/D6B3096B093D07F4882577C7006487... (accessed November 10, 2010). Archived by WebCite® at http://www.webcitation.org/5u8vCi0XG. World Vision. Haiti: World Vision provides aid to around 1.8 million people. http://www.wvi.org/wvi/wviweb.nsf/updates/B5E8DE689CD41ABE882577040008C6... (accessed November 10, 2010). Archived by WebCite® at http://www.webcitation.org/5u8vq3gwl. World Vision. Haiti: World Vision says much has been done but road to recovery will take years http://www.wvi.org/wvi/wviweb.nsf/updates/BD33F364B90D9FF88825775E00122B... (accessed November 10, 2010). Archived by WebCite® at http://www.webcitation.org/5u8vae8TG. World Vision. Haiti earthquake response: One year later (PDF). http://www.worldvision.org/content.nsf/learn/haiti-relief?OpenDocument&l... (accessed January 12, 2011). Archived by WebCite® at http://www.webcitation.org/5vh7NPwLJ. World Vision. Hope Initiative. http://www.wvi.org/wvi/wviweb.nsf/maindocs/052F3121CB381D7E8825753C00794... (accessed January 11, 2011). Archived by WebCite® at http://www.webcitation.org/5vfMUIzuz. World Vision. Newsroom. http://www.wvi.org/wvi/wviweb.nsf/maindocs/226C8B2D88F716F688257387007E1... (accessed January 11, 2011). Archived by WebCite® at http://www.webcitation.org/5vfM3laKz. World Vision. Planet prepare: Preparing coastal communities in Asia for future catastrophes http://wvasiapacific.org/latest/the-world-is-changing-planet-prepare.html (accessed November 10, 2010). Archived by WebCite® at http://www.webcitation.org/5u9On0ReB. World Vision. Reports and publications (PDF). World Vision. Responding to Disasters. http://www.wvi.org/wvi/wviweb.nsf/section/DC63CF15990F2E808825737F007E31... (accessed January 11, 2011). Archived by WebCite® at http://www.webcitation.org/5vfLnzNAB. World Vision. Serving and helping the poor in nearly 100 countries (PDF). World Vision. What we do. http://www.wvi.org/wvi/wviweb.nsf/maindocs/018080C3FFC683ED88257387007D1... (accessed January 11, 2011). Archived by WebCite® at http://www.webcitation.org/5vfMLm8Vg. World Vision. 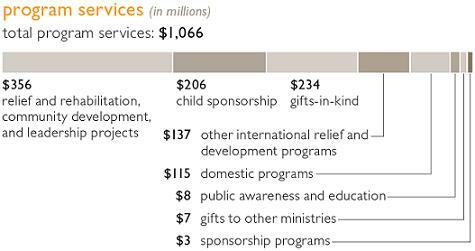 World Vision Overview (PDF). World Vision. World Vision U.S. Site. www.worldvision.org (accessed January 11, 2011). Archived by WebCite® at http://www.webcitation.org/5vfMbPjwF. 6. World Vision, “6-month report,” Pg 7. 7. World Vision, "Haiti Financial Update: 1 year later." World Vision, “Haiti earthquake response: One year on,” Pg 31. 350,448 people received urgently needed household supplies such as toilet paper, soap and toothpaste, cooking supplies, bed sheets, blankets, buckets, mosquito nets, foot lockers and mats. 229,763 households received food aid in the first three months of the response. 70,938 children in 454 schools benefited from school feeding programmes between August and October. More than 180 feeding centres provided food to 49,200 children not in school. 132,153 people were provided with 189.6 million litres of drinkable water. 5,653 children registered to play, sing, dance and draw in one of 22 Child-Friendly Spaces. More than 1,150 young children ages 3 through 8 attend one of 15 Early Childhood Development Learning Spaces that provide community-based learning. 113,409 tarpaulins and 7,497 tents were provided to families in need. Transitional shelters were provided for an initial 620 families. More than 14,770 people participated in cash-for-work programmes. 1,988 people participated in cash-for-training programmes, learning skills such as gardening techniques, masonry and carpentry. Five fixed and four mobile health clinics served 11 camps in Port-au- Prince and two mobile clinics served three camps at the border." World Vision, "Haiti earthquake response: One year on," Pg 3.
young people living in AIDS-affected areas." World Vision, "Annual review 2009," Pg 1. World Vision. "Global Hope Initiative: Annual Report 2009: Executive Summary, " Pg 3. World Vision, “Global Health and Nutrition Annual Report 2008."